Should I come in for a massage when I’m sick? That’s a good question. When you’re feeling sick and achy it might sound like a great idea to come in for a nice warm massage and have your aches and pains soothed by healing hands. In reality, it’s actually never a good idea to come in for a massage when you’re sick! Let’s discuss why. I have a cold, not the flu or a bacterial infection. Is it serious enough to reschedule my massage? Yes. 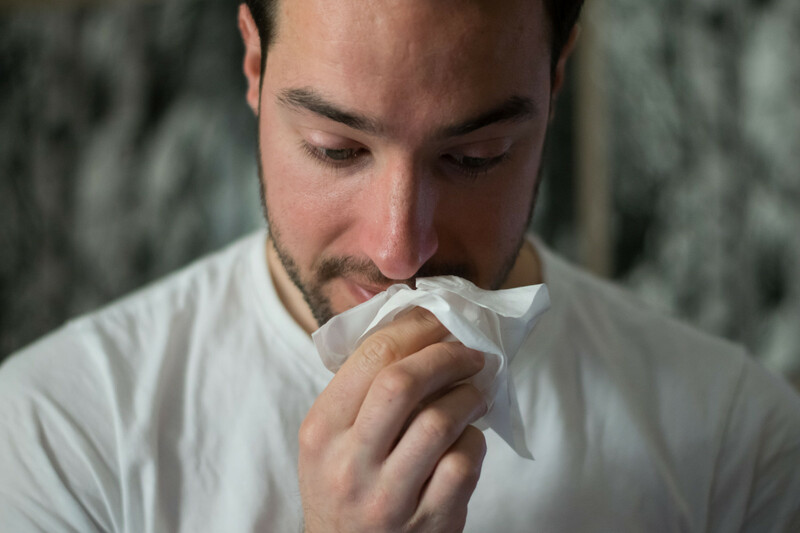 It can be difficult to distinguish between a cold, the flu, and certain bacterial infections. In fact, both viruses and bacteria can cause some illnesses. Bronchitis and sinus infections are two examples. I don’t think I’m contagious. Should I reschedule? Yes. You cannot know for certain whether or not you can spread viruses or bacteria. You may spread a virus one day before symptoms develop. You may spread a virus if you still have symptoms—even if you have almost recovered. You may spread bacteria until you take an antibiotic for 72 hours and your symptoms have subsided. Do the studio’s sanitation practices prevent risk? Our studio strictly adheres to Washington State Department of Health standards for sanitation. However, cold and flu viruses, along with bacteria, spread through the air. Even if you cover your cough or sneeze, you send infected droplets through the air when you talk. Treatment rooms are enclosed and humid spaces. Infected droplets can land in the mouth or nose of your therapist. They can land on hair, skin, and clothes and stay infectious for several hours. Clients and staff can then carry your virus back to work or home and infect others—especially those in high-risk groups. Clients and staff who are at high risk include pregnant individuals, people who are 65 and older, people who have chronic conditions such as asthma, and people who are immunosuppressed such as cancer patients. When you’re sick, it’s best to play it safe. Don’t put others at risk, and don’t put yourself at risk! Government, US. “Common Colds: Protect Yourself and Others.” Centers for Disease Control and Prevention, Centers for Disease Control and Prevention, 12 Feb. 2018, www.cdc.gov/features/rhinoviruses/. Government, US. “Your Best Shot Is the Flu Shot.” Centers for Disease Control and Prevention, Centers for Disease Control and Prevention, 25 Sept. 2017, www.cdc.gov/features/flu/. Holliman, Casey. “Should You Still Get a Massage When Sick?” Performance Bodywork, Performance Bodywork, 29 Mar. 2014, performancebodywork.com/massage-when-sick/.